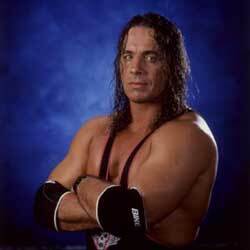 History: Bret Hart, son of wrestler and trainer Stu Hart, grew up in a large family. The competition from his many brothers made him determined to be a great wrestler like his father. Wrestling with the likes of "The British Bulldog" Davey Boy Smith and "The Crippler" Chris Benoit, among others, in his father's Dungeon, Bret soon learned his craft well. He became one of the main attractions as "The Hitman" in the Calgary Stampede Federation, as well as a few other organizations. He earned part of his mystique due to his shyness. In interview segments, since he didn't want the audience to see his eyes, he started wearing wraparound shades. 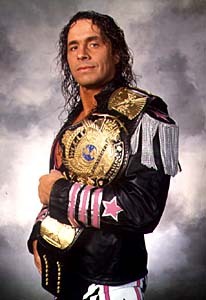 With the Calgary Stampede, Bret had 2 reigns as the British Commonwealth Mid-Heavyweight Champion; was a 5-time International Tag-Team Champion; and won the North American Heavyweight Belt 6 times. In 1985, he joined the World Wrestling Federation, wrestling in a low-card status for a time. He was then recruited by Jimmy "Mouth of the South" Hart and was teamed up with Jim "The Anvil" Neidhart, his future brother-in-law, forming the rulebreakers known as the Hart Foundation. After a year together, the team finally made it to the top, defeating the British Bulldogs for the Tag-Team Titles in January '87, partially thanks to the help of Danny Davis, the referee they had paid off. They engaged in feuds with the Bulldogs for the next few months, which included making Davis wrestle with the Hart Foundation. The team went on to other feuds with various tag-teams in the WWF, holding the belts until the end of October, when they were finally defeated by Strike Force (Tito Santana & Rick Martel). Soon after, the Hart Foundation slowly turned face, eventually dropping their manager Jimmy Hart and going out on their own. They had some epic feuds with Demolition, the Rougeau Brothers, the Brain Busters, Rhythm & Blues, the Russians, Power & Glory, and the Rockers, among other teams, and spent the next two years fighting their way back up the ladder. In August '90, they finally made it, defeating Demolition in a 3 Falls match at Summerslam and becoming the Tag-Team Champions for the second time. The two wrestlers defended the belts until Wrestlemania VII, where they fell to the Nasty Boys. Soon after, Hart and Neidhart went their separate ways, with the Hitman trying out the singles waters. It didn't take long for Hart to shake up the WWF as a singles competitor. During the King of the Ring competition in '91 (which was televised), Hart defeated Pete Dougherty, Skinner, and Irwin R. Schyster to take the tournament. Because of this win, Hart was given the Intercontinental Title shot against Mr. Perfect (Curt Hennig) at Summerslam. Hart came through, defeating Perfect with his new finisher, the Sharpshooter, to become the champ. Hart held the title until the beginning of '92, when he lost the belt to the Mountie in a controversial house show match. Hart was said to have had a high fever at the time, which led to his defeat. Since his illness kept Hart from using his rematch for the title, he gave his shot over to "Rowdy" Roddy Piper. Piper used the shot well, defeating the Mountie at the '92 Royal Rumble. Hart then met Piper for the belt at Wrestlemania VIII. The two fought hard, but kept things clean, as Piper decided not to use a foreign object to win the match. This proved to be a mistake, as Hart won out in the end, winning the Intercontinental Title for the second time. Hart and Piper then parted as friends. Hart would defend the Intercontinental Championship for over four months before losing it to another family member, his brother-in-law, the British Bulldog. The two fought at Summerslam '92, with the Bulldog coming out triumphant. Afterwards, Hart congratulated the Bulldog, keeping the family ties strong. The Hitman then moved on, heading upwards towards the top of the bracket. In October '92, he completed his climb, defeating Ric Flair to become the WWF World Champion. Hart stayed the champion for almost six months, having some great matches with wrestlers like Papa Shango, Shawn Michaels, and Razor Ramon (Scott Hall). The Hitman usually employed the Sharpshooter to come out the victor and remained the World Champ. Hart's next challenger turned out to be a true heavyweight in Yokozuna. The two men met up at Wrestlemania IX, where Hart took the edge with his Sharpshooter. However, salt thrown in Hart's eyes by Yokozuna's manager, Mr. Fuji, allowed Yokozuna to escape and get the victory, taking away the World Title. When Hulk Hogan came out to protest the decision, Yokozuna challenged him, and Hogan quickly pinned the large man to get the victory and the title. Hart, meanwhile, left the ring without the gold. Bret moved away from the World Title for a time, concentrating instead on the King of the Ring '93. A former winner of the tournament, Hart was considered one of the favorites. He proved himself worthy, defeating Razor Ramon, Mr. Pefect, and Bam Bam Bigelow to once again become the King of the Ring. However, his win was tarnished when he was attacked by Jerry "The King" Lawler during his inauguration. This started a drawn-out feud between Lawler and Hart, which came together at Summerslam '93. First, because Lawler was supposedly injured, Hart fought and defeated Doink. Lawler then attacked Hart, and their match got underway. Furious, Hart got the Sharpshooter on Lawler and refused to let go, earning himself the DQ. In the next few weeks, Hart began a new feud with Shawn Michaels, who continuously insulted Hart's family. Bret brought his brothers Owen, Bruce, and Keith to the Survivor Series to fight Michaels' paid-off knights (each of whom was masked). At one point during the fight, Bret was on the apron, hurting from the attacks he had taken, while Owen fought Michaels (the only wrestler left on his team) in the ring. Owen was whipped into Bret, sending him crashing into the guardrail. It also enabled Owen to get pinned by Michaels, making him the only Hart brother eliminated. After Michaels was eliminated, Owen came back to ringside, in a rage about what had happened. He said that he was stuck in Bret's shadow. This was the start of one of Bret's longest-running, most-emotional feuds. The two wrestlers tried to reconcile in the next few months, teaming together against the Quebecers at the Royal Rumble. The Quebecers currently held the Tag-Team Titles. The odds looked good for the Hart brothers, but Bret's knee failed him during the match, and the ref decided to end the fight. Owen snapped, attacking Bret, and leaving his brother behind. All was not lost in the night, though, as Bret went on to somehow, despite the injury, co-win the Royal Rumble with Lex Luger. Both fell out at the same time, making it impossible to tell who won. Thus, both became the #1 Contender to the World Title, currently held by Yokozuna. Bret dealt with both details, feuding with his rampant brother while also contending for the title. Eventually, it was settled, as Bret would face both Owen and the winner of Luger/Yokozuna at Wrestlemania X. Bret had a mixed night. First, Owen upset him, getting the victory in their fight. Then in the main event, Bret managed to fight through Yokozuna (who had snuck past Luger with a DQ victory), getting revenge for his earlier loss and gaining the World Title for the second time. Bret then started a new feud with Diesel (Kevin Nash) & Shawn Michaels, while also continuing his rivalry with his brother Owen. At King of the Ring, Bret defended his belt against Diesel. Since Diesel had Michaels in his corner, Bret enlisted his former tag-team partner, Jim "The Anvil" Neidhart, to help even the odds. This turned out to be a mistake, though, as Neidhart turned on Bret, first attacking Diesel to cause the DQ, then hammering Bret. Neidhart's actions were later explained, as he helped Owen win the King of the Ring. This made Owen, Bret's long nemesis, the #1 Contender to Bret's Title. The odds seemed against Bret, with two family members against him. But Bret wasn't out of wrestling family yet, as he got the British Bulldog to be his partner. With the Bulldog and the Anvil on the outside, Bret and Owen met at Summerslam '94, this time in a Steel Cage match. It was a great fight, with Bret barely escaping the cage first to retain his title. The feud wasn't over, though, as Owen and Neidhart attacked the Bulldog and Bret afterwards. This led to numerous confrontations between the two teams in the coming months, with Owen and Neidhart trying repeatedly to get the World Title from Bret. The two were later joined by a new ally, the former World Champion, Bob Backlund. Backlund was uncontrollable, with his violent submission hold, and made a formidable opponent. At the '94 Survivor Series, the two wrestlers faced off in an I Quit Towel match. Owen was in Backlund's corner, while the Bulldog once again supported Bret. In the end, though, Owen turned out to be the better ally. With the British Bulldog out cold, Owen helped Backlund get Bret into the chicken-wing submission hold, then begged Bret's and Owen's mother to throw in the towel. Tearfully, she did, giving Backlund the World Title. The Hitman's war with Backlund and Owen continued for a long while afterward, even when Backlund lost the World Title to Diesel. Bret didn't forget about the World Title, though, challenging Diesel for it at the Royal Rumble '95. But interference from Owen, Backlund, Shawn Michaels, Jeff Jarrett, and others led to the match being a draw. This made the Hitman more determined to settle things with Backlund, and the two met up for a final time at Wrestlemania XI. In another brutal match between the two, Bret came out on top, forcing Backlund to submit to the Sharpshooter. This finally cooled down the Bret-Owen feud somewhat, as Bret went back to where it all started, battling with Jerry "The King" Lawler again. After battling Lawler's stooge Hakushi and defeating him at In Your House I, Hart, weakened, was taken down by Lawler. The two met again at King of the Ring '95, where Lawler, after losing, was forced to kiss Bret's foot. Hart went on to take out Lawler's paid assailant Issac Yankum (later Kane), then dispatched with a pirate named Jean Pierre Lafitte. After these battles, Hart was ready to come back to the big time, renewing his acquaintance with the World Champion, Diesel. They battled at the Survivor Series in another classic match between the two. Due to what had happened the last time they had fought, the match was made No Disqualification. There had the be a winner. In the end, Hart, using his mind, managed to roll up the big man and get the victory, becoming the 3-time World Heavyweight Champion. Hart went on to have a one-month feud with his former ally, the British Bulldog, defeating him at In Your House 5. Hart's next challenge was at the Royal Rumble '96, where the Undertaker tried to take the gold from him. Before a victor could be decided, though, Diesel came out, attacking Bret and getting him the DQ victory. This got things going between Diesel and Bret again, leading to the two fighting in a Steel Cage match at In Your House 6. This ending was also marred by interference, as the Undertaker surprisingly came through a hole in the mat and pulled Diesel under the ring. Bret got the victory, retaining the title. Hart next went back against Shawn Michaels, and the two were set up in a 60-minute Iron Man Match at Wrestlemania XII. It has been argued as being one of the greatest matches in WWF history, as both men went to their limits and beyond. At the end of the time limit, the Hitman had the Heart Break Kid in the Sharpshooter. Unfortunately, the time expired, leaving the decision undecided. This led to the powers that be announcing that the match would continue in Sudden Death. Michaels, able to recover during the short break, managed to get the pin on Bret, taking away the World Title. Hart then left the wrestling business for the next few months, taking some time off to rest and recuperate. In the later months of '96, "Stone Cold" Steve Austin began sending out challenges to Hart in his interviews. After many insults from Austin, Bret finally reappeared, to the crowd's delight. Hart faced off against Austin in a great technical match at the Survivor Series. The two fought for nearly 30 minutes, with Hart getting the pinfall victory in the end to show that he was still a major player in the WWF. Hart then went back to the top brackets, going after then-World Champion Sycho Sid. Unfortunately, interference from Hart's old nemesis Michaels cost Hart the win. Hart then became less of a fan-favorite, going after Michaels any chance he could get. He fought hard at the Royal Rumble, trying to win to become the #1 Contender to the World Title (which Michaels had won earlier over Sid). Hart managed to eliminate his other main adversary, Austin, but Austin snuck back into the ring, as his elimination wasn't seen by the referees. Austin went on to win the Rumble, tossing Hart out. Due to the oversight, a Final Four Battle Royale match was set up between Hart, Austin, and the other two individuals in the Rumble at the end, the Undertaker and Vader. The match later became a vacated World Title match, after Michaels dropped the belt. The four men fought for a long while, with no one being eliminated for the first 18 minutes. Finally, Hart got rid of Austin, throwing him out of the ring. After the Undertaker eliminated Vader, Hart finished things off by tossing the Undertaker, winning the World Title for the fourth time. Unfortunately, the reign would only last one day, as Bret lost to Sycho Sid the next night after Austin hit Hart with a chair. Bret and Austin continued to feud, with the Hitman slowly becoming a darker character to the fans. Hart continued to complain about how he always got screwed out of victories, complaining bitterly about how things worked in the WWF. Austin and Hart faced off once again at In Your House 14. This time, Austin got the victory, winning via DQ after the Hart Foundation interfered. The next night, in a Street Fight match, Hart injured his knee, after a chairshot from Austin. Hart was out of the ring for the next month, although he continued to be the voice of the Hart Foundation, leading his troops into countless battles. Hart returned to the ring in July '97, where he led the Hart Foundation against Austin and his new allies Ken Shamrock, Goldust, and the Legion of Doom. Bret's team got the victory, when Owen got the pinfall on Austin. Bret then moved on to Summerslam as the #1 Contender, to face the World Champion at the time, the Undertaker. In a surprise move by Vince McMahon, Shawn Michaels was made the special guest referee. Hart and Michaels bickered throughout the match, and in the end, Michaels tried to attack Bret. The Hitman ducked, though, and Michaels hit the Undertaker instead. Hart made the quick pin, and Michaels was forced to count the 1-2-3, giving Hart his 5th WWF World Title reign. After facing the Undertaker one more time at One Night Only, where he won via DQ, Hart went through a brief feud against the Patriot and Vader, with the British Bulldog again helping him out. The Canadians won out over the American team. Hart then went back to feuding with Michaels, who had allies of his own in Hunter Hearst Helmsley and Rick Rude (the start of Degeneration-X). The two faced off at Survivor Series '97 in a highly-anticipated match. It soon, however, became one of the most infamous moments in wrestling history. Earlier in the month, Hart had given his notice to Vince McMahon, saying that he was leaving the WWF. This was to be his final match. At one point during the fight, Michaels got Hart in a version of the Sharpshooter. Before Hart could fight his way out, McMahon came out and ended the match, making Michaels the World Champion. The screwjob completely shocked the Hitman, as it wasn't part of the expected storyline. Hart spit in McMahon's face and walked out. It was later claimed that the two fought in the backstage area, with Hart breaking McMahon's jaw. Either way, Hart was finished with the WWF. A month later, in December '97, Bret showed up in WCW, where he quickly was announced as the guest referee for the Eric Bischoff-Larry Zbysko match at the next PPV. Both WCW and the nWo factions believed that Bret was with them. Bret showed where he stood at Starrcade, stopping Scott Hall's interference for Bischoff with the Sharpshooter. Zbysko won via disqualification. Hart then made himself known in the main event, when he helped Sting win the World Title from nWo leader Hollywood Hogan. In the next few weeks, Bret was joined in WCW by his brother-in-laws Jim "The Anvil" Neidhart and the British Bulldog, both of whom left the WWF in protest of what happened. Bret then began a minor feud with Ric Flair, with both proclaiming they were the best wrestlers. Hart faced Flair at Souled Out '98, where the Sharpshooter once again went into effect, giving the Hitman the submission victory. Hart also defeated Flair at the Boston Brawl, an Internet pay-per-view. Hart and Flair then settled their differences and began teaming up against the nWo. Hart also seemed to have a new ally in Brian Adams, who came out during one of Bret's interviews and said he would be there for the Hitman. This turned out to be a trick, though, as Adams held Hart for an nWo attack by Curt Hennig. This started another feud between Hart and Hennig (who, as Mr. Perfect, faced Hart many times in the WWF). At Uncensored, Hart made Hennig submit to the Sharpshooter. However, after the match, Rick Rude entered the ring and took Hart out with the Rude Awakening, making sure that the heat stayed between the wrestlers. Rude & Hennig then started assaults on the rest of Hart's family, along with Adams. But Hart almost always made the save, beginning to call himself the "Sheriff" of WCW. Shortly thereafter, however, Bret turned on the fans once again, helping Hollywood Hogan defeat "Macho Man" Randy Savage to gain the World Title. It seemed that Hart had joined the nWo, even though he never wore the colors. Hart then started in a long-term feud with Savage, which eventually involved "Rowdy" Roddy Piper, who was the ref at their match at Slamboree '98. At the end of the match, Hart managed to trick Piper into giving him the Disqualification victory. At the next Nitro, Piper reversed his decision, giving Savage the win. Hart protested the change, but then set up another match, pitting Hart & Hollywood Hogan against Piper & Savage at the Great American Bash. It was in this time period that Bret continued to call himself "the best there is, the best there was, and the best there ever will be." Hart spent the next few weeks fanning the anger between Piper and Savage, making their team unstable. He also became the nWo's major recruiter, trying to pull in Chris Benoit and Sting, among others. He interfered in Benoit's TV Title #1 Contender's match against Booker T, but Benoit wouldn't accept the win, telling the ref instead what had happened. Hart then gave up on his fellow Canadian, concentrating instead on Piper and Savage. At the Great American Bash, Hart & Hogan won out, as Piper & Savage just couldn't work well as a team. Hart finished it off with the Sharpshooter on Savage. Hart then became even more violent, attacking many wrestlers with steel chairs, trying to put them out of wrestling. In July '98, Hart became one of the main contenders for the vacated United States Heavyweight Title. He was scheduled to fight Diamond Dallas Page for the belt at a Nitro. During the night, Page was brutally attacked by unknown individuals, most likely members of the nWo. At the end of the night, the Hitman defeated the badly-injured DDP, forcing him to submit to the Sharpshooter. This won Hart his first gold in WCW, the United States Championship. The next week, Hart began proclaiming himself the friend of Sting, saying that the two men had so much in common, including the same finishing maneuver. At a later Nitro, when Lex Luger was taken out in the back, Hart offered to be Sting's teammate in a bout against the tag-team champions, Scott Hall and the Giant. After Hart knocked out Hall with the bat (while possibly swinging at his partner), Sting got the pinfall. Unfortunately, the ref reversed the decision after seeing Hart's bat swing, and the titles stayed with the nWo. 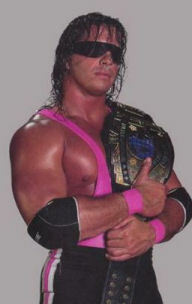 It was later revealed from Luger that the man who attacked him to keep him out of the tag-team title fight was Bret Hart. Hart and Luger met on a Nitro for the US Title, and after Hart missed a shot with brass knuckles, Luger applied his Torture Rack and got the victory, taking away Hart's belt. This lasted for three days, as Hart came back at Thunder to win the rematch with the Sharpshooter, after a chair shot on Luger. Hart was once again the United States champion. In the next few weeks, Hart began showing signs of becoming a face again, refusing to attack Sting on a number of occasions. He also aided Lex Luger by attacking his brothers-in-law, Neidhart and the Bulldog, during a handicap match. Hart then teamed with Luger to defeat the two men, apparently signaling that Hart had joined with Luger and Sting, leaving the nWo behind. Hart was still signed to join the nWo team at Fall Brawl, however, in the War Games match. Hart fought as hard as all the wrestlers, but failed to come out on top, as Diamond Dallas Page won the #1 Contenders spot. Hart was also supposedly injured in the brawl, as his old knee injury resurfaced. In the next few weeks, Hart moved further and further from the nWo, asking the fans for another chance. He fought with Sting against Buff Bagwell & Scott Steiner at one point, then entered into a match with Hogan. During the fight, Hogan concentrated on Hart's knee, apparently injuring it worse. Hart was then replaced in the match by Sting, and was carted out on a stretcher. However, as Sting and Hogan continued to fight, and as a screen showed Luger being taken out in the back, Hart limped back to the ring, then surprisingly attacked Sting, rejoining the nWo. This started weeks of brawls between an infuriated Sting and Hart. At Halloween Havoc, Hart defeated Sting in a great match, ending it by attacking Sting with a bat while the referee was down. At the next Nitro, Hart lost the US Title to Diamond Dallas Page, and savagely beat Page with a chair afterwards. Hart then went on a rampage, trying to injure other wrestlers as he did Sting and DDP. Page returned to attack Hart, saving other wrestlers from the beatings. Page and Hart then faced at World War III, in another exciting match between the two. At one point, Hart was awarded the victory by the nWo referee, after he knocked Page out with a foreign object, then applied the Sharpshooter. However, another referee came down and restarted the match, taking the place of the nWo referee. Before Bret could protest, he was rolled up and pinned by DDP. The next Nitro, Hart challenged DDP to a rematch for the US Title at a later show. The match was booked, but then Hart tried to back out, claiming 'injuries'. But Page wouldn't hear of it, and jawed at Hart long enough to get a No-Disqualification Match signed. This turned out to be another Hitman trick, though, as Hart had the Giant come out during the match and Super-Chokeslam Page from the top turnbuckle. This allowed Hart to get the Sharpshooter and become the WCW United States Champ for the 3rd time. After this, however, Hart slowly faded into the background, continuously complaining about a groin injury that kept him from wrestling. In March '99, Hart appeared on the Mad TV show, and ended up attacking one of the comedians, Will Sasso, in what was supposedly an unplanned skit. A week later, Hart was forced by Ric Flair to defend the US Title, injured or not, against "Rowdy" Roddy Piper. During the long match, Will Sasso appeared, helping Piper defeat Hart and take the title. Hart later easily defeated Sasso in a very forgetful match (where Sasso's coworker Debra Wilson turned on him, knocking him out with a chair). In April '99, the Hitman came out and started to challenge the best in the WCW to face him. He said that he could defeat Goldberg in 5 minutes. In Toronto, Canada, with the main portion of Hart's fans watching, Hart tricked Goldberg into using his Spear, knocking himself out on the Steel Plate hidden under Hart's jersy. Hart made an unofficial pin, then grabbed a mike and told Eric Bischoff that he quit. Bret then vanished from WCW for a long period of time, due to his having groin surgery. At Slamboree '99, Bret made his shocking reappearance, hitting Goldberg with a chair during his main event match with Sting. He brutally went after Goldberg's knees with the chair, making the fans hate him more than ever. After that, Kevin Nash appeared on the Tonight Show and challenged Bret to a bout. Bret accepted. Unfortunately, tragedy soon brought wrestling screeching to a heart for the Hitman. On May 23rd, 1999, Owen Hart died in a tragic wrestling accident in the WWF, falling from the ceiling when his rope gear failed to hold him. Bret, devestated, left wrestling for a long period of time. He appeared once in June on Nitro, thanking the fans for their support, but not knowing if he would wrestle again. In September '99, Bret returned to the scene and laid out a challenge, saying that he wanted to fight Hulk Hogan. Hart started to follow Hogan around, wanting his shot. In one segment, Hogan, Hart, Lex Luger, and Sting, all considered faces at the time, were in a locker room, when the lights went out. When they were turned back on, Sting was facedown in the room, and everyone accused the others for the assault. At Fall Brawl, it was learned that Sting and Luger were the ones going bad, as they took out Hogan to get the World Title. Hart soon sided with Hogan against the two heels, almost a reverse of the nWo days. Hart, Hogan, and Ric Flair fought against Sting and Luger, with Hart taking some serious bat shots, including one to the face when he had Luger in the Sharpshooter. On October 4th, 1999, Hart scheduled a match against his friend, Chris Benoit. The two men dedicated the bout to Owen. The match was technically unbelievable, with some great maneuvers from both men. Hart won the tribute match by putting Benoit in the Sharpshooter, and the two men parted friends. The next week, Hart and Benoit teamed to fight against Lex Luger and Rick Steiner. They won via DQ, as Sid Vicious interfered. Luger beat on Hart's leg, until Goldberg came to the rescue. Luger and Hart met at Halloween Havoc '99, but Hart's leg was in too bad shape, and he was forced to submit. Despite the leg injury, Hart came to Nitro determined to fight in the WCW World Title Tournament. Sting had been forced to vacate after attacking an official, setting up the tournament. Hart battled Bill Goldberg in the first round match, for the US Title. Goldberg had the advantage through most of the match, but interference from the Outsiders allowed Bret to get the win, for his 4th US Title reign. Hart, disgusted by the interference, later vacated the title. Hart and Goldberg soon started teaming against the force of Sid Vicious and the Outsiders. Hart and Goldberg, in a 4 Way US Title match, fought against Scott Hall and Vicious. Kevin Nash, the special guest referee, proved to be the deciding factor, as Hall became the new champion, after Nash took out Hart with a baseball bat. This didn't stop Hart from moving on in the tournament, as he defeated Perry Saturn and Billy Kidman to make it to the Semis at WCW Mayhem. Hart again fought his former nemesis, Sting. The duo put on a great match, despite interference from the Total Package against the Stinger. Hart took out Luger, then managed to get the Sharpshooter on Sting, getting the victory. Hart then went to the Finals against his friend, Chris Benoit. Another great match ensued, also with interference from Dean Malenko as well as the Outsiders. In the end, Hart reversed the Crippler Crossface into the Sharpshooter, getting the submission victory. 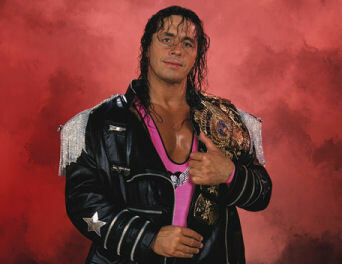 Bret Hart finally was holding the WCW World Title, becoming one of only a few wrestlers to hold both the WCW and WWF Heavyweight Championships. Afterwards, Benoit and Hart shook hands once again, staying friends. The feuding between various factions soon came to a head, as Hart and Benoit found themselves fighting against the Outsiders, with Goldberg and Sid Vicious forming a third party. Hart and Jeff Jarrett also fought, with Jarrett siding with the Outsiders. Hart and Goldberg also still teamed together, though, as they won the tag-team straps from Creative Control (the Harris Brothers) in December '99. Still, there was tension between the two, as Hart and Goldberg were scheduled to fight at Starrcade for Hart's World Title. The Outsiders took advantage of the tension, challenging the two men for the Tag belts they had just won a week before. After an assault on Hart left his knee in bad shape again, Goldberg took on the Outsiders alone. Hart appeared near the end of the match to help Goldberg out, but his bad knee allowed Nash to pin him and get the victory and the titles. At Starrcade '99, Hart and Goldberg battled a long match for the World Title. During the match, "Rowdy" Roddy Piper came out to be the referee. Hart managed to get on the Sharpshooter on Goldberg, and Piper immediately called for the bell, without Goldberg submitting. It was similar to when Hart was screwed out of the WWF belt, and it was learned that Vince Russo, recently entering WCW after working with the WWF for a long time, rigged it that way to "make it even" for Bret. Hart apparently didn't like the way things had gone, and vacated the World Title the next Nitro, saying that Goldberg deserved another shot at it. Hart also confronted Piper, who seemed to feel horrible about what happened. Hart and Goldberg fought for the belt at the next Nitro, in a short-lived match, as the Outsiders and Jeff Jarrett came to ringside. In a major swerve, they attacked Goldberg, along with Hart, who made the pin to become the World Champ for a second time. Hart, Jarrett, and the Outsiders then spraypainted Goldberg and Piper, who had tried to make the save. The nWo was back. With the band back together, Hart and the rest of the nWo feuded with Goldberg, Sid Vicious, Chris Benoit, and other wrestlers for the next month or so. 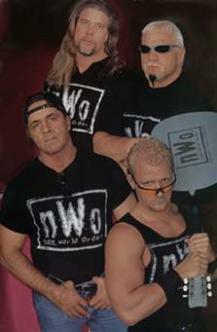 The nWo was being backed by Russo and "The Powers That Be", making them the strongest group in WCW. Scott Steiner soon pulled another swerve, joining the nWo as well, and Hart's group was more powerful than ever. The group feuded with Sid Vicious & Chris Benoit, among others, and had a memorable moment when they threw Sid into his car, then crushed the car with a monster truck. However, just as things were looking their best for Hart, things fell apart. A major concussion, that many assumed was caused by a stiff facekick from Goldberg, forced Hart to the sidelines, and he was forced to vacate the World Title. The concussion shook the man to his core, keeping him off television for many months. 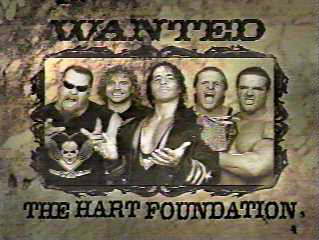 Hart next appeared during the Eric Bischoff/Vince Russo takeover in April '00. Bischoff & Russo had declared war against the more established stars, which they called the Millionaires' Club. They went on to form the New Blood, a group of the younger wrestlers. That Nitro, Hart appeared in the crowd, then confronted Bischoff & Russo at the end of the show, without saying a word. A few weeks later, when Bischoff was fighting Hulk Hogan, Hart came down to the ring with a chair. Although the show then ended, the fans found out later that Hart had clocked Hogan with the chair. Hart then started pursuing Hogan again, saying that Hogan was afraid of Hart. Hart wasn't sure he could wrestle again, but that he still wanted one more fight with Hogan. Unfortunately, with the concussion being more severe then at first known, Hart again went on the injured list. In August '00, the Hitman appeared at New Blood Rising after the Lance Storm/Mike Awesome match. Storm had won thanks to help from the special referee Jacques Rougeau. Hart then walked down the aisle and entered the ring, and the three Canadians embraced. A few weeks later, Hart appeared at a Nitro, knocking out Goldberg with a shovel after Goldberg had dug a grave for Vince Russo. Hart also interfered in the War Games 2000 match, slamming the cage door in Goldberg's face to keep him from winning the World Title (Nash won it instead). But this was one of Hart's last hurrahs in WCW, as he was later terminated from the federation due to his injury status, having not been in a wrestling match since the beginning of '00. "We are never prepared for what we expect. It is with deep regret and sadness that I officially announce that my career as a professional wrestler is over...forever. Due to the severity of numerous concussions, I received in late December 1999 and early January 2000 as the reigning WCW World Champion my Doctors have advised me that any physical return to the ring would hold serious consequences for me. So, after great deliberation it has become clear that it is best for me, my family and my fans that I say goodbye. I would like to thank every single wrestler I ever worked with. I wanted to thank my loyal fans all around the world. I owe you all for what I am. I never really worked for an honest wrestling promoter except my Dad who I especially want to thank. Wrestling has been my life forever. I have been extremely fortunate in what I have achieved and what I have attained through wrestling. Wrestling will always be in my blood. I sincerely hope that I can impart some of the lessons I have learned to those now involved and to those on the way up. I hope that by doing so, the wrestling business will be a better business for the people that make it happen. The wrestlers. The Hitman will always be known as one of the great stars of professional wrestling, and as one of the few who have won both the WCW and WWF World Titles. For many of his fans, he will always be thought of as the best there is, was, and ever will be. - Stampede International Tag-Team Title Tournament (March '82) = Bret & Bruce Hart defeated Mike Shaw & Tab Rogers and Mo Chi Lau & the Cuban Assassin, before falling to the eventual winners, Duke Myers & Kerry Brown. - WWF World Junior Heavyweight Title League '84 (January 1 - February 7, '84) = Hart competed in the League, which was won by the Dynamite Kid. - NJPW Sumo Hall (February '84) = Hart & the Black Tiger were beaten by Isamu Teranishi & Kuniaki Kobayashi. - WWF Wrestlemania II ('86) = Hart wrestled in a "Battle Royal", which was won by Andre the Giant. - WWF Saturday Night's Main Event #8 (November '86) = The Hart Foundation (Hart and Jim "The Anvil" Neidhart) lost to the Killer Bees. - WWF Saturday Night's Main Event #10 (February '87) = The Hart Foundation defended the WWF Tag Belts by defeating Tito Santana and Dan Spivey. - WWF Wrestlemania III ('87) = The Hart Foundation and Danny Davis defeated the British Bulldogs and Tito Santana. - WWF Saturday Night's Main Event #11 (April '87) = The Hart Foundation lost a "3 Falls" Match to the British Bulldogs, but, due to one of the falls being a DQ, retained the WWF Tag Belts. - WWF Saturday Night's Main Event #12 (September '87) = The Hart Foundation stayed the WWF Tag Champs by defeating the Young Stallions. - WWF Saturday Night's Main Event #13 (November '87) = Hart was defeated by "Macho Man" Randy Savage. - WWF Survivor Series '87 = The Hart Foundation, the Islanders, Demolition, the Russians and Greg "The Hammer" Valentine and Dino Bravo fought in a "Tag-Team Elimination" Match against the British Bulldogs, Young Stallions, Strike Force, the Rougeau Brothers and the Killer Bees. Hart and Neidhart were eliminated when "B" Brian Brunzell pinned Hart. The Killer Bees and the Young Stallions were the "survivors". - WWF Royal Rumble '88 = Hart competed in the "Royal Rumble", which was won by "Hacksaw" Jim Duggan. - WWF Wrestlemania IV ('88) = Hart wrestled in a "Battle Royal", which was won by Bad News Brown. - WWF Wrestlefest '88 = Hart was beat by Bad News Brown. - WWF Saturday Night's Main Event #17 (October '88) = The Hart Foundation again lost to Demolition, who retained their belts. - WWF Survivor Series '88 = The Hart Foundation, the Powers of Pain, the Rockers, the British Bulldogs and the Young Stallions fought in a "Tag-Team Elimination" Match against the Brain Busters, the Conquistadors, Demolition, the Bolsheviks and the Fabulous Rougeau Brothers. Hart and Neidhart were eliminated when Terry Blanchard pinned Hart. The Powers of Pain were the "survivors". 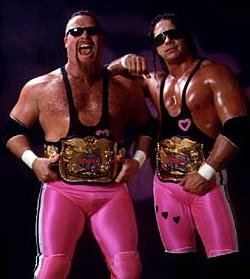 - WWF Summerslam '89 = The Hart Foundation lost to the Brain Busters. - WWF Survivor Series '89 = Bret Hart, "Hacksaw" Jim Duggan, Hercules and "Rugged" Ronnie Garvin fought in an "Elimination" Match against "Macho King" Randy Savage, Dino Bravo, Greg "The Hammer" Valentine and the Canadian Earthquake. Hart was eliminated by Savage. Earthquake, Bravo and Savage were the "survivors". - WWF Royal Rumble '90 = Bret competed in the "Royal Rumble", which was won by Hulk Hogan. - WWF Wrestlemania VI ('90) = The Hart Foundation quickly beat Nikolia Volkoff and Boris Zuhkov. - AJPW US/Japan Wrestling Summit (April 13th, '90) = Hart fought to a draw with Tiger Mask. - WWF Saturday Night's Main Event #26 (April 23rd, '90) = The Hart Foundation and the Rockers fought to a Double Disqualification. - WWF Survivor Series '90 = The Hart Foundation, Dusty Rhodes and Koko B. Ware fought in an "Elimination" Match against Ted DiBiase, the Undertaker and Rhythm & Blues. Hart was eliminated by DiBiase, who was the sole "survivor". - WWF Royal Rumble '91 = Bret was involved in the "Royal Rumble", which was won by Hulk Hogan. - WWF Saturday Night's Main Event #29 (April '91) = Hart and Ted DiBiase fought to a Double Count-Out. - WWF Summerslam '91 = Bret won the WWF Intercontinental Title by beating Mr. Perfect. - WWF King of the Ring Tournament (September 7, '91) = Hart defeated Pete Dougherty, Skinner, and Irwin R. Schyster to win the tournament. - WWF Survivor Series '91 = Hart, "Rowdy" Roddy Piper, Davey Boy Smith and Virgil fought in an "Elimination" Match against Ric Flair, Ted DiBiase, the Warlord and the Mountie. Hart was DQ'ed. Ric Flair was the "survivor". - WWF Tuesday In Texas (December '91) = Bret stayed the I-C Champ by forcing Skinner to submit. - WWF Wrestlemania VIII ('92) = Bret won the WWF Intercontinental Belt from "Rowdy" Roddy Piper. - WWF Summerslam '92 = Bret lost the WWF I-C Title to the British Bulldog. - WWF Saturday Night's Main Event #31 (October '92) = Hart stayed the WWF World Champ by forcing Papa Shango to submit. - WWF Survivor Series '92 = Hart retained the WWF World Title by forcing Shawn Michaels to submit. - WWF Royal Rumble '93 = Hart forced Razor Ramon to submit, retaining the WWF World Title. - WWF Wrestlemania IX ('93) = Hart lost the WWF World Title to Yokozuna. - WWF King of the Ring '93 = Hart defeated Razor Ramon, Mr. Perfect and Bam Bam Bigelow to win the KOTR tournament. - WWF Summerslam '93 = Hart forced Doink to submit, then lost, via DQ, to Jerry "The King" Lawler. - WWF Survivor Series '93 = Bret, Owen, Keith and Bruce Hart fought in an "Elimination" Match against Shawn Michaels and his 3 Knights. Bret, Keith and Bruce were the "survivors". - WWF Royal Rumble '94 = Bret and Owen Hart lost to the Quebecers, who retained the WWF Tag Titles. Later in the night, Bret co-won the "Royal Rumble" with Lex Luger. - WWF Wrestlemania X ('94) = Bret was pinned by his brother, Owen Hart. Later in the night, Hart defeated Yokozuna for the WWF World Title. - WWF King of the Ring '94 = Hart retained the WWF World Title, but lost, via DQ, to Diesel. - WWF Summerslam '94 = Hart stayed the WWF World Champ by winning a "Steel Cage" Match over Owen Hart. - WWF Jacques Rougeau Retirement Show (October '94) = Hart defended the WWF World Title by beating Jim "The Anvil" Neidhart. - WWF Survivor Series '94 = Hart lost the WWF World Title in a "submission" match to Bob Backlund. - WWF Royal Rumble '95 = Bret and Diesel fought to a No-Contest, with Diesel retaining the WWF World Title. - WWF Wrestlemania XI ('95) = Bret won an "I Quit" Match over Bob Backlund. - WWF In Your House 1 (May '95) = Hart defeated Hakushi. Later in the night, Hart lost to Jerry "The King" Lawler. - WWF King of the Ring '95 = Hart won a "Kiss My Foot" Match over Jerry "The King" Lawler. - WWF In Your House 2 (July '95) = Hart beat Jean Pierre Lafite in a dark match. - WWF Summerslam '95 = Hart won, via DQ, over Issac Yankem. - WWF In Your House 3 (September '95) = Hart forced Jean Pierre Lafite to submit. - WWF In Your House 4 (October '95) = Hart defeated Issac Yankem in a dark match. - WWF Survivor Series '95 = Hart won the WWF World Title from Diesel in a "No DQ" Match. - Stu Hart Tribute Show (December 15, '95) = Hart stayed the WWF World Champ by beating Davey Boy Smith. - WWF In Your House 5 (December 17, '95) = Hart retained the WWF World Title by beating the British Bulldog. - WWF Royal Rumble '96 = Bret retained his WWF World Title by winning, via DQ, over the Undertaker. - WWF In Your House 6 (February '96) = Hart stayed the WWF World Champ by winning a "Steel Cage" Match over Diesel. - WWF Wrestlemania XII ('96) = Bret lost the WWF World Title in an "Ironman" Match with Shawn Michaels. - WWF Survivor Series '96 = Hart defeated "Stone Cold" Steve Austin. - WWF Middle East Cup Tournament (December 2, '96) = Hart beat the British Bulldog and Steve Austin to win the tournament. - WWF In Your House 12 (December '96) = Hart lost to then-WWF World Champ Psycho Sid. - WWF Royal Rumble '97 = Bret competed in the "Royal Rumble", which was won by Steve Austin. - WWF Triple Threat (January '97) = Hart lost a "Triangle" Match to WWF World Champ Shawn Michaels, with Psycho Sid as the other participant. - WWF WWF In Your House 13 (February '97) = Hart won the WWF World Title by defeating the Undertaker, Vader, and Steve Austin in a "Final Four" Match. - WWF Wrestlemania XIII ('97) = Bret "TKO"ed "Stone Cold" Steve Austin in a "Submission" Match. Ken Shamrock was the special referee. - WWF In Your House 14 (April '97) = Hart lost, via DQ, to "Stone Cold" Steve Austin. - WWF In Your House 16 (July '97) = The New Hart Foundation (Bret, Owen Hart, Jim "The Anvil" Neidhart, Davey Boy Smith and Brian Pillman) defeated Steve Austin, Ken Shamrock, Goldust and the Legion of Doom. - WWF Summerslam '97 = Bret won the WWF World Title for a 5th time, defeating the Undertaker. Shawn Michaels was the special referee. - Fifty Years of Funk (September '97) = Hart defeated Terry Funk. - WWF One Night Only (September '97) = Hart stayed the WWF World Champ by winning, via DQ, over the Undertaker. - WWF In Your House 17 (October '97) = Bret stayed the WWF World Champ by forcing the Patriot to submit. - WWF In Your House 18 (November '97) = Hart and the British Bulldog defeated Vader and the Patriot. - WWF Survivor Series '97 = Hart lost the WWF World Title to Shawn Michaels. - WCW Starrcade '97 = Hart was the special referee for the Larry Zbyzsko - Eric Bischoff match, which was won, via DQ, by Zbyzsko. - WCW/nWo Souled Out '98 = Hart forced Ric Flair to submit, winning the match. - WCW Boston Brawl (January '98) = Hart again made Ric Flair submit. - WCW Uncensored '98 = Hart used his Sharpshooter to get Curt Henning to submit. - WCW Slamboree '98 = Hart, via disqualification, won the match against "Macho Man" Randy Savage (later reversed by the Special Referee, "Rowdy" Roddy Piper). - WCW Great American Bash '98 = Hart and Hollywood Hogan defeated "Macho Man" Randy Savage and "Rowdy" Roddy Piper. - WCW Bash At The Beach '98 = Hart lost, via DQ, to then-WCW TV Champion Booker T.
- WCW Fall Brawl '98 = Hart was involved in the War Games Match, along with Hollywood Hogan, Stevie Ray, Diamond Dallas Page, "Rowdy" Roddy Piper, the Warrior, Kevin Nash, Sting, and Lex Luger. DDP was the winner. - WCW Halloween Havoc '98 = Hart retained the WCW United States Title, defeating Sting. - WCW World War III '98 = Hart was defeated by the United States Champ, Diamond Dallas Page. - WCW Halloween Havoc '99 = Hart was forced to submit to the Total Package Lex Luger. - WCW Mayhem (November '99) = Hart got a submission victory over Sting, then went on to beat Chris Benoit in the finals to become the new WCW World Champion. - WCW Starrcade '99 = Hart defended the World Title by defeating Bill Goldberg. - WWE Wrestlemania XXVI (March 28, '10) = Hart won a "No Rules Lumberjack" Match over Vince McMahon. Bruce Hart was the special referee. - WWE Summerslam '10 (August 15) = Team WWE (Hart, John Cena, Daniel Bryan, Edge, Chris Jericho, John Morrison, & Edge) won an "Elimination" Match over the Nexus (Wade Barrett, Justin Gabriel, David Otunga, Skip Sheffield, Heath Slater, Michael Tarver, & Darren Young).